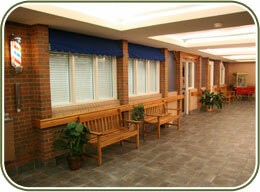 Bethel Lutheran Nursing & Rehabilitation Center has 150 licensed skilled care beds. Services are provided through 5 neighborhoods: Horizon Tower, Harmony Square, Pine View Court, Wheatland Square, and Legacy Square. 104 private rooms enhance the quality of life for our residents. The neighborhoods deliver care through quality staff who are trained to meet the individual needs of our residents. Care Partners assigned to the individual neighborhoods include nursing, social services, activities, housekeeping and laundry. Additional support staff include rehabilitation therapy, nutritional services, environmental services and administration. Each neighborhood has its own dining room and neighborhood care station with decor that is specific to each area. For more information about our skilled care services please contact the Admission Coordinator, Char Borud, at 701-572-6766 or e-mail admissions@blnrc.com.